What are these mythical symbols and how do they fit into Hawaiian culture? If you've ever seen the wooden, novelty representations of the ancient hand-carved figures, you will notice by their readied stances and stern facial expressions that a tiki was intended to represent very important, respected authorities, namely principal gods, guardians and spirit powers. Very few tiki lovers are aware of the unique history and spirituality of tiki images, but even a brief description of the ancient purpose of the tiki will give you a glimpse at the very essential role symbolism played in traditional Hawaiian society. The first inhabitants of Hawaii voyaged from Polynesia about one thousand years ago, bringing with them religious and spiritual convictions. 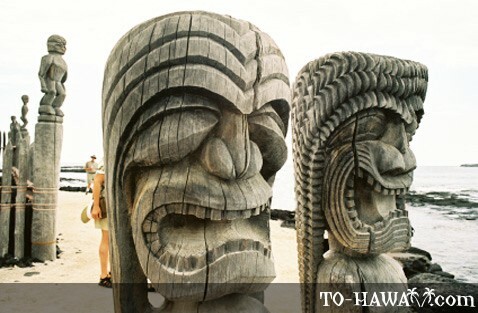 The many gods of Hawaii and Polynesia were represented by tikis. 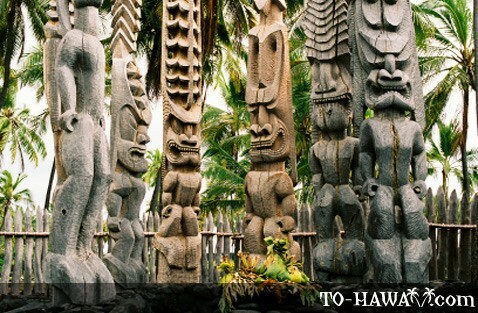 The name tiki can refer to many different types of images used throughout Polynesia, from images used ceremonially by Maori tribes in New Zealand, to the moa carvings on Easter Island, to modern day images displayed in Hawaii. 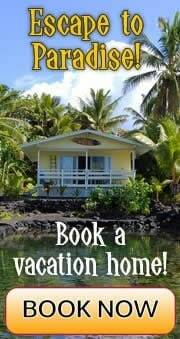 In Polynesian mythology, tiki often represents the first human being on Earth. These images are still used today in some Polynesian cultures in the context of spiritual practice. It is not uncommon for small tiki figures to be worn for protection from infertility in New Zealand. 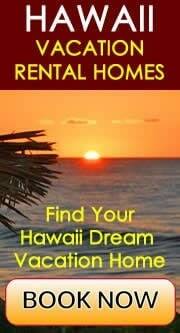 In ancient Hawaiian culture, the gods, the aina, or land, and the kanaka, or people, shared a symbiotic existence. If the people took care of the land in a pono (right) manner, the gods were appeased. If the gods were happy, they would allow the land to provide sustenance for the people through verdant growth. Each god had many kinolau, or forms, including human and animal forms. Tiki statues were carved to represent the image of a certain god and as an embodiment of that specific god's mana, or power. With well-formed tikis, perhaps the people could attain protection from harm, strengthen their power in times of war and be blessed with successful crops. The ancient Hawaiians kept their gods close using many creative forms of communication. Tikis were created as a medium of connection or interaction. Through continued communication with these all-powerful deities, the Hawaiian people were sure to follow the right path to appeasement. 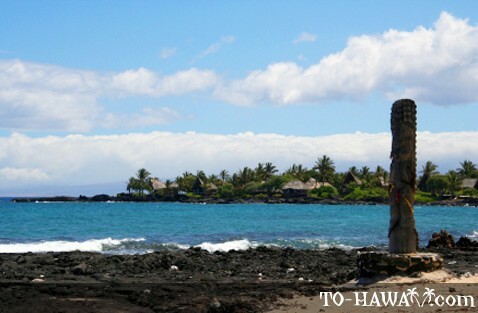 All Hawaiian people were said to have descended from the lineage of the gods. It was the job of the alii nui, or high chiefs, to make sure everything was in societal balance and that the ultimate respect was paid to the gods through many avenues. The alii nui were considered direct descendents of the gods and thus carried great responsibility. 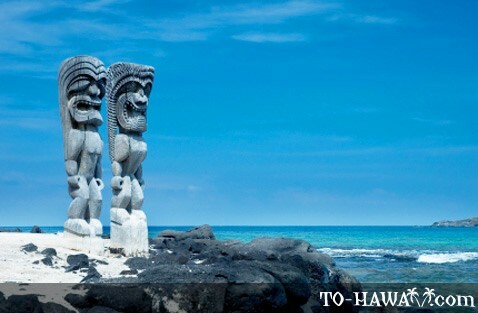 In addition to tiki images, the higher spirits and ruling deities were paid homage through every action undertaken in ancient Hawaiian society. From the whalestooth pendants, feathered helmets and feathered cloaks worn by kings, to animal sacrifice and the religious practices that separated men and women during meal times, divine guidance ruled society. The ancient system of religion called aikapu was abolished by King Kamehameha II in 1819, and the majority of temples and religious images, including tikis, were destroyed. However, some tiki artifacts remain to this day in remembrance of a time when strict religious beliefs guided the Hawaiian society. According to Hawaiian history, there was a time when gods walked the earth as men, and tiki images recognize not only their divinity, but also their human qualities as well. Tikis reminded the people just how close the realm of the gods was and reinforced their acknowledgement of the awesome power the gods sustained. 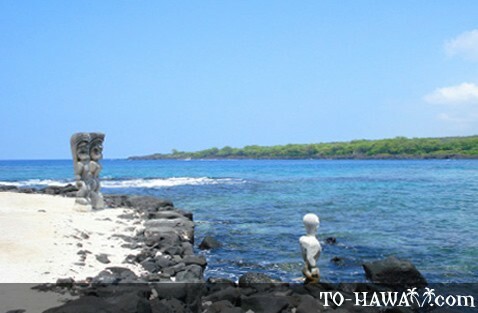 The first stone tikis were said to have been carved around the year 1400 in the Marquesas Islands. The tiki can take many crafted forms, from giant sculptures of the war God Ku, to images of variant gods carved into drums, boats, or other utilitarian objects, to petroglyphs carved into rock or tattoo patterns on the body. The artistic likenesses created in tikis demonstrate a high level of craftsmanship and perfectionism. The most recognized tiki character has a strong, stocky body with a rectangular head, seemingly wearing a headdress. This mysterious figure is to a degree an intimidating one, with large eyes and a stance that suggests he is ready for war. Beginning in the 1930s, an entire "tiki culture" representing the island life of the South Pacific began to form around these odd statues. Tiki-themed restaurants displayed kitschy memorabilia, such as tiki carvings, tiki torches, rattan furniture, tropical-print fabrics and wooden or bamboo items. Tiki bars served mai tais and other fruity island drinks. Before long, tiki culture had a large following in the United States, using South Pacific themes in everything from clothing to interior design. 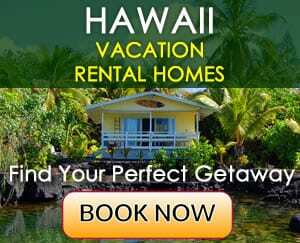 After Hawaii became a state in 1959, tiki culture, the aloha shirt and other island representations were incredibly en vogue. Today, you can find giant wooden figures in several spots around the Hawaiian Islands, including the Polynesian Cultural Center on Oahu's North Shore. At La Marianas on Sand Island in Honolulu, possibly the most popular tiki bar in Hawaii, visitors can enjoy a tropical cocktail amidst an overwhelming amount of tiki memorabilia. 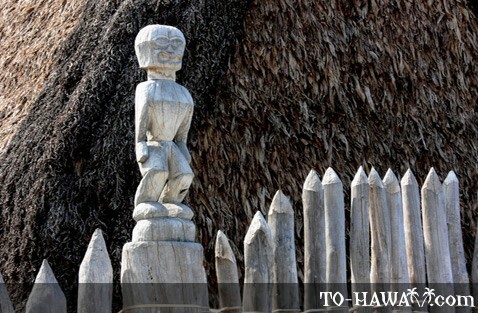 Visitors to Hawaii can find a tiki image pretty much anywhere, but when you are browsing through the tourist-aimed mass-manufactured tiki items, remember how these images once represented the beloved and revered Hawaiian gods.